Exploring a new career path can bring about a lot of questions. One of the most common questions – what dental assistant classes do I need to take? Starting school can be a confusing time. With so many options to choose from, it’s hard to know which ones are best. But the good news is that taking dental assistant classes doesn’t have to be complicated. While there may be a lot of different schools to choose from, the basic curriculum is quite simple. Dental assistants need to be taught one thing – how to assist a dentist! It might be surprising to learn that some dental assistant schools teach material that is not essential to being a dental assistant in order to fill up time in the program. Sure, the information might be relevant to someone at some point in their life. But if it is not relevant to becoming a dental assistant then it shouldn’t be taught in dental assistant classes. Arizona holds no degree requirements in order to work as a dental assistant so there are no course requirements that need to be met. However, a person will need dental assistant training before beginning a job in a dental office. Dental assistant classes usually come in shorter programs lasting less than one year and longer ones lasting more than a year. The core curriculum is still the same no matter the length of the program. And picking classes that offer heavy instruction on the most important aspects of dentistry is important. After all, wouldn’t you rather spend your time in dental assistant classes learning about dentistry? The only course a person really needs is a course in dental assisting that teaches all of the aspects of dentistry. X ray certification is important too and will be taught in some dental assistant classes, depending on the program. Finding a school that teaches both can be beneficial. The American Institute of Dental Assisting teaches 13 week dental assistant classes with true hands on training. 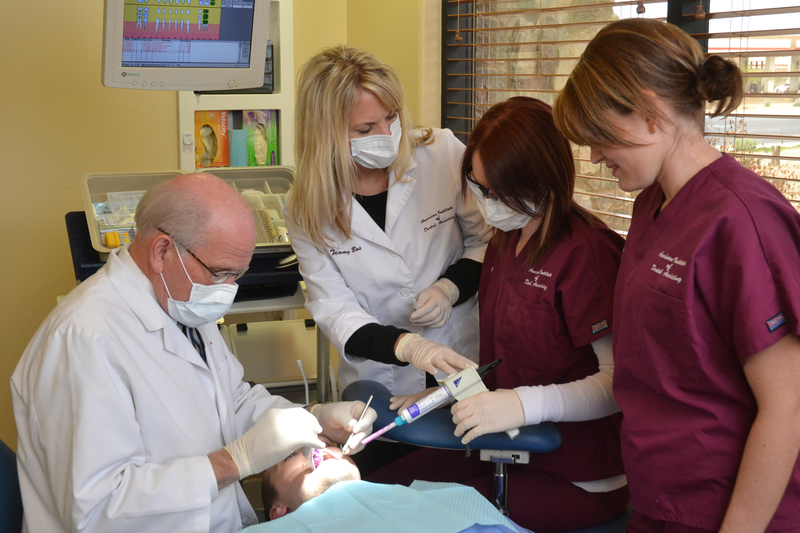 Students will learn dental assisting on real patients and with real dentists in an actual dental clinic. Dr. Eldon Hastings, school owner and director, personally created this unique curriculum to maximize learning and focus strictly on the necessary knowledge and skills needed to gain employment in the dental field.